This wash day was almost identical to last week’s. The major difference is that I didn’t rush this time. I was watching Homeland while I was doing my hair so I may have left the pre-poo and conditioner on longer than normal. Do you watch Homeland? If you do, what do you think about what happened to Peter? (1) Pre-poo and Detangling: Using 8 sections, I detangled with my seamless comb. I applied Creme of Nature Intensive Conditioning Treatment and covered with a plastic bag for 1 hour. I didn’t use my heating cap this time. I detangled again to make sure most of the shed hair was gone. I didn’t put my hair in braids. (2) Shampoo and Coffee Rinse: I washed my hair twice using diluted Creme of Nature Argan Oil Shampoo and peppermint essential oil. My hair felt very smooth. I think I’m getting a better handle on my hair using sections. However, I may go back to braids from time to time. My scalp feels cleaner when I use sections. Then, I rinsed with coffee and rinsed the coffee out after 5 minutes. I used my turbie twist to dry for about 10 minutes. (3) Deep conditioning and ACV Rinse: I used Hairveda Sitrinillah I kept it on for 45 minutes with heat and almost 20 minutes without heat. (Homeland was getting too interesting.) I rinsed out the conditioner with cool water and did an ACV rinse. I kept the ACV on for about 2 minutes and rinsed again with cold water. Then, I used a t-shirt to dry my hair for 15 minutes. (4) Leave-ins and Styling: I applied my leave-ins (Aphogee Keratin Restructurizer and African Naturalistas Leave-in Conditioner) and sealed it with my oil mix. I braided my hair using ORS Wrap/Set lotion and curled the ends using perm rods. I allowed it to dry overnight and I took them down the next day. I hope you didn’t find this too boring. Next wash day will be more exciting because . . . I’m flat ironing my hair. It’s been over 7 months since I last flat ironed. I want to try a few new techniques and I hope it will last. Your braid out is beautiful. I tried braid out on my natural hair, it wasn’t dry so it poofed up as I was taking the braids out lol. Lovely braid out. Thanks, Lisa. How long did you leave it to dry? Your braid out looks amazing. I love that it’s so full. I can never get my braid out to look good it always comes out messy. Thanks, Hilda. I think having it dry completely helps with definition. Lovely braid out! 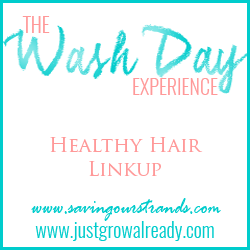 I can’t wait to see your flat iron results next wash day! Your braids out came out really well. I love the shine too. I love how moisturized your hair looks! +1 to the braid out chica!